ISLAMABAD — Thousands of flag-waving protestors marched into Pakistan's capital Monday to demand changes to the country's political system just months before scheduled elections. 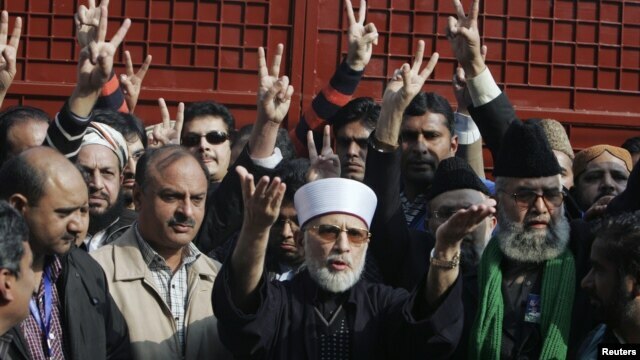 Led by Canadian-Pakistani cleric Tahir-ul Qadri, the rally to reform the country's electoral system forced cell phone services to shut down, shops to close their doors, and riot police to stand ready as protestors flooded central Islamabad. Some 20,000 people were said to be driving and walking from the eastern city of Lahore, picking up supporters on the way, and protest organizers predicted the numbers would reach hundreds of thousands by evening. Analysts say Qadri is tapping the people's deep frustration with ongoing violence and a deteriorating economy as the nation prepares to vote for a new government in the coming few months. "Basically this is about change, and I know that is kind of vague and everyone wants change, [but] the difference with this protest is that it's not just about talking the talk, it's about walking the walk as well," said Mariam Khalid, who flew from her home in Britain to join the protest. "What Dr. Tahir-ul Qadri is saying is basically that the people are sick of the situation in Pakistan; there is no food, no electricity, people are dying — basically, that's the reality." Relatively unknown until he arrived in Pakistan a few weeks ago, Qadri has spent the last seven years in Canada leading an Islamic charity group with branches around the world. Now his television ads are on all of Pakistan's major stations and he is gathering thousands of people to protest what he calls a broken and corrupt political system that any election will just perpetuate. 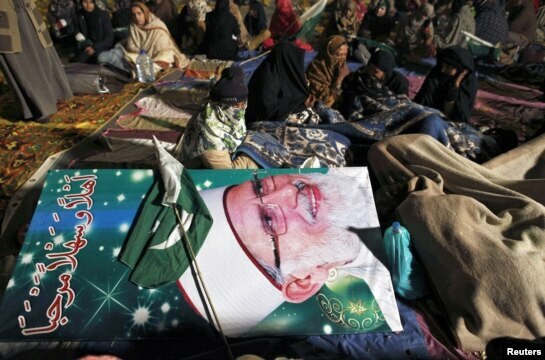 Skeptics are questioning Qadri's timing, and who may be backing the cleric's campaign; some suspect the military is behind him, an accusation both Qadri and the military establishment have denied. Tariq Junaid, head of Pakistan's Institute for Public Opinion Research, says the political impact of Qadri's so-called "democracy march" remains to be seen. "It all depends on the pressure that Dr. Qadri will create," said Junaid. "If it remains less than 100,000, I don't think so, in my personal view, that it will catch the attention of the main political parties, because there is a general consensus among the media [and] among civil society that the real test for a political party to undergo are elections." Junaid says it is unclear how Qadri's demand that the political system be cleaned out before any vote is held could be met. ​​Today's protest comes just after a three-day demonstration by Hazara Shi'ite in Quetta, capital of eastern Baluchistan province, protesting against one of the worst sectarian attacks in the country's history, in which nearly 100 in their community were killed. After thousands of Shi'ites sat in the roads by the bodies of their dead, the federal government finally gave in to one of the protesters' key demands and fired the provincial government.